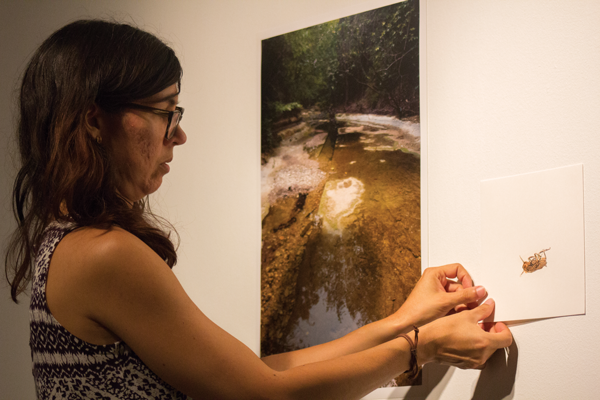 David Sanchez/ The Et Cetera Gallery director Iris Bechtol installs art pieces for the “In Good Company” show on campus. atop white podiums, and paintings and drawings created with a variety of techniques and colors line the walls. But Bechtol is drawn to an unobtrusive piece, a white lump wrapped in thin strings hanging from the ceiling. It’s by far the most minimalist piece in the room, but she sees past the lack of detail. Bechtol, campus galleries director, curator of the permanent art collection and an art professor, teaches in the same room where she sat as a student in the ‘90s. “She wants people — students, me and you — to think, to always be thinking about what we’re seeing and thinking about why we are looking at the things we’re looking at,” he said. Bechtol earned a bachelor’s degree in fine arts at the University of North Texas and a Master of Fine Arts from the University of Texas at Arlington. Before working at Eastfield, she was the art gallery director at El Centro College. Bechtol curates shows for the two campus galleries — Gallery 219 and H Gallery — from student, faculty and professional work. She also oversees the college’s permanent collection of 142 art pieces displayed across campus. Though she admires contemporary art, Bechtol tries to offer diverse works. Artist Melissa Mohammadi met Bechtol over social media through mutual friend Willburn. The women admired each other’s work, and Bechtol invited Mohammadi to present a piece alongside hers in last month’s “In Good Company” show. “I haven’t known her very long, but I’ve loved communicating with her and I think she’s really passionate, very warm and generous,” Mohammadi said. Students show up to classes with a wide range of experience, Bechtol said. Some have no experience, and others thoughtlessly throw work together and call it “art,” Bechtol said. She pushes all her students to consistently question their own work. Willburn said Bechtol’s love for life and nature make her a great artist, teacher and curator. Her style reflects her smart personality and her unique way of perceiving things in life.